Are you stuck shopping for a wine lover, with no idea where to begin? Yeah, we’ve been there. Why head to a wine store when there are some truly unique online wine gifts? Our wine gifts buying guide offers some unique gifts for wine lovers, as well as some of the most popular and, ultimately, some of the best wine gifts. These are online wine gifts that we’ve given, we’ve received, or, more often than not wish that someone had presented to us (hint hint!). Let us help you find the perfect wine gift, for a birthday, wedding, holiday, or really any ole time that demands a great wine lovers gift. This is a mega post that offers so many recommendations for great gift ideas for wine drinkers. If searching for something particular, though, the table of contents above includes links to each of our recommended gifts for wine lovers, which are included in this wine gifts review. In this post, we share our recommendations for some of the best gifts for wine lovers. We know because we are wine lovers ourselves. It’s one of the main reasons why we moved from Asia to Europe. To have more access to great wine. Once we rented our apartment, we spent time now only buying wine, but also buying wine racks, wine glasses, decanters, and more. Even before we left the US we were wine lovers. We owned a 75 bottle wine refrigerator, wine tasting sets, and over 100 wine glasses. When friends showed up at our home with a bottle of wine or more unique wine gifts, we were thrilled. We always knew we would get something out of it because some of the best gifts for wine drinkers are those that are thoughtful and useful. Our list of gifts for a wine lover includes information on how to send wine gifts, particularly in the US. We provide advice on how to choose a wine club or wine subscription, which can be one of the best wine gifts. It’s the wine gift that keeps on giving. There are also tips on how to find interesting wine related gifts, like unique wine glasses or other wine-themed gifts. The best? You can purchase all of these wine gifts online, without leaving the house. You can shop while enjoying your own glass of wine at home. There’s more to purchasing gifts for wine drinkers than purchasing a case of wine online. Sure, that can work and it can get the job done. But a really great way to send wine as a gift is to find something a little more unique. This can be a wine gift basket or some cool wine accessories. But, there are some things to keep in mind when shopping for wine gifts online. At the top of my list of things to consider with gift ideas for wine lovers is worrying about the wine delivery service that is available. Many of our recommended online wine gifts can be purchased on Amazon, not only in the US, but in Europe, or even Australia. Outside of the US, it’s easier to send wine as a gift. In the US, mailing wine as a gift can get a little more complicated. There are certain US states that restrict shipments of wine. And, the states that do allow wine bottles to be shipped require an adult to sign for the package. This kind of puts a damper on when you want to buy wine online for a gift. I talk more about these issues with accepting wine in the mail in our review of the best wine clubs, so it’s worth checking this out. But, not every wine tasting gift involves the complicated issues of shipping wine. There are plenty of other options out there that don’t require you to send a bottle of wine. In this wine gift buying guide, we will help you find the perfect presents for wine lovers, no matter your budget. And, many of these can be great gift options for destinations where you can’t actually ship wine. Now that we’ve gotten through the legal issues that come from buying the best online gifts for wine lovers in the US, let’s run through our recommendations. These wine gift ideas include one-time wine gifts or year-long online wine gifts. They also include inexpensive gifts for wine lovers and more pricey wine connoisseur gifts. Basically, it’s a run through of all sorts of gift ideas for wine lovers, even the pickiest on your list. Whether you call them wine baskets or wine hampers, it seems that a gift basket with wine is one of the more traditional online wine gifts. They’ve been around forever. But, there are a few companies out there who are doing some more unique things. For the food and wine lovers, it’s possible to purchase wine and cheese gift baskets, or wine and chocolate gift baskets. Or, perhaps a “wine gift basket” doesn’t even need to include a bottle of wine – making it easier to deal with wine delivery. 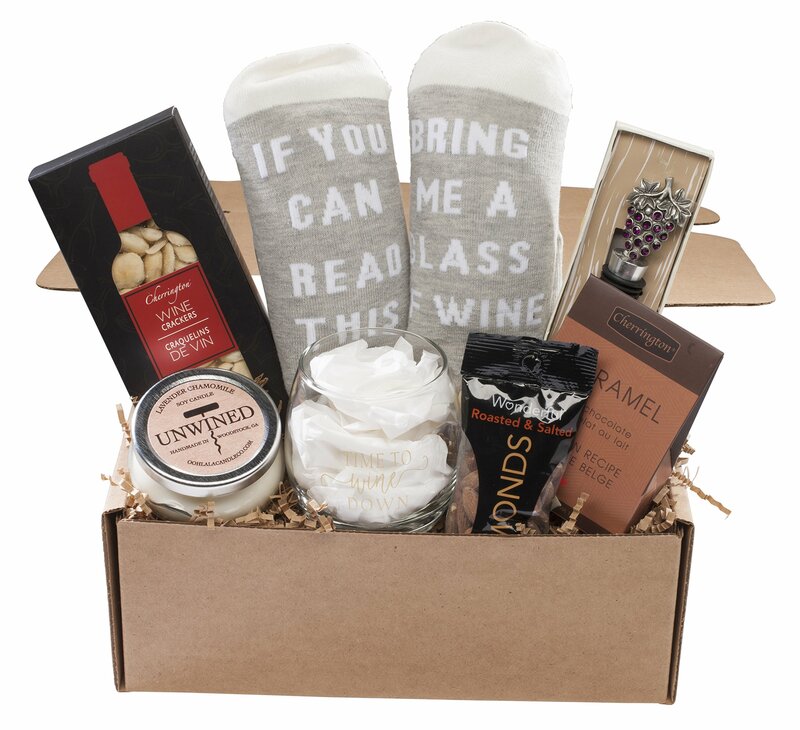 Check out this Gift Basket With Wine Lover Socks. Who doesn’t need socks that read “If you can read this bring me a glass of wine”? This gift basket also includes a scented candle, a decorative wine stopper, and a stemless wine glass. Everything needed for a relaxing evening of wine at home. Baskets like this also make great wine birthday gift ideas. And, these make good wine gifts in the US because there is no need to worry about shipping issues. A wine hamper or a basket of wine and cheese gifts can be great wine-related gifts, but the downside is that it is only a one time gift. But purchasing a regular online wine delivery, that arrives monthly or quarterly, is the gift that keeps on giving. But, it’s something that’s certainly hard to buy at a wine shop. A wine subscription is one of the best gifts for wine lovers. I’ve done a lot of research on the best online wine club, including options that make a great wine subscription gift. One of my favorite wine club gift options is Winc. Winc is changing the world of club wine. The old stuffy wine clubs have been replaced by unique, young, hip Winc. That’s what makes it an option for cool wine gifts. Winc asks 6 starter questions to determine each wine member’s palate preferences. Then, Winc matches their wines with the wine drinker’s palate. Each month, Winc ships the wines. Members rate each bottle in the monthly wine delivery to further fine-tune future shipments. Similarly, Wine Down takes the love of wine and matches it with charcuterie. Each monthly box includes a bottle of carefully selected wine, along with paired cheese and cured meats. They promise to get members out of their wine rut and introduce them to unique, artisan Californian wines. And, purchasing a regular wine and cheese club shipment is the wine basket gift that keeps on giving. A wine gift box, loaded with all sorts of fancy wine related gift ideas can be a great gift for wine lovers. Many of these wine gift sets include different kinds of wine bottle openers, wine stoppers, or even great wine glasses. Any of them would make a great gift for a wine lover. 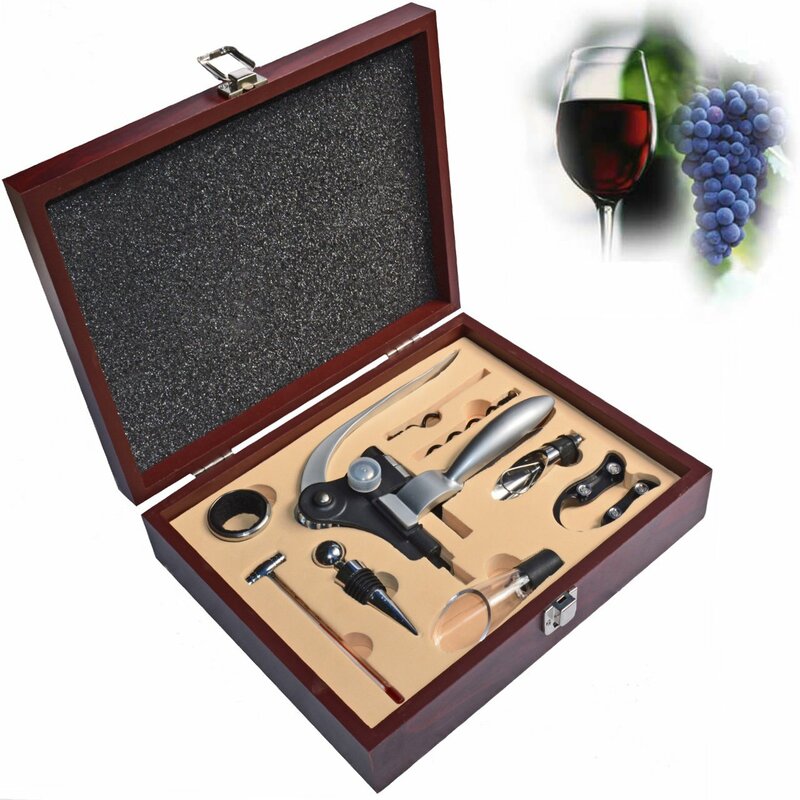 This 9 piece wine gift set includes a Rabbit Lever Corkscrew and other wine accessories, in an elegant wood box. It’s a pretty classic gift for wine lovers, but always appreciated it. We had a set similar to this and I loved it not only for opening wine, but for keeping the accessories organized as well. Check the current price here. Or, it’s possible to take these wine gift sets a little more high-tech with an electronic wine opener. This YIMI Electronic Wine Opener Gift Set includes a super cool electronic wine opener, which easily opens a wine bottle with the press of a button (and an awesome blue light). It also includes a smart wine thermometer, which can tell you the exact wine temperature of the bottle before it is opened. 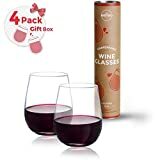 Check the current price of this unique online wine gift here. Ivation also offers a pretty slick wine gift set. 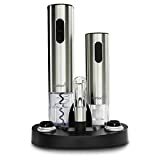 The Ivation Wine Set includes a dual directional electronic corkscrew, an electronic wine preserver to better store the remainder of a wine bottle, and an automatic aerator, that aerates wine as it is poured. If you know a lot less about wine than the person you are buying a wine gift for, trust me, this is one of the most cool gifts for wine lovers because it’s loaded with all sorts of cool wine accessories. It’s a gift for the wine lover who has everything. Check the current price of this unique wine accessory gift here. And, gift sets don’t always have to come in a box! This 9 Piece Wine Travel Bag and Picnic Set, yes, comes in a bag. And, it’s a bag that holds two wine bottles, and everything else someone would need for a wine-focused picnic, including metal wine glass stakes, which are stuck into the ground to hold the wine glasses. Genius! Check the current price of these presents for wine lovers here. Sometimes trying to buy wine for a wine lover is a challenge, particularly if you are not a wine lover yourself. How can you tell the difference between fine wine, good wine, and cheap wine? So, perhaps some unique wine accessories gifts could be a great option. Looking for clever ways to pour wine or store wine, particularly in ways that are artistic or high-tech, can please even the biggest wine snob. These make great gifts for wine connoisseurs. And, if you can’t order wine delivery as a present, then look for some gifts to go with a bottle of wine – wine accessories. Gifts like a crystal wine decanter or a glass wine decanter are a way to buy a unique wine gift that is not only practical but can be artistic and elegant as well. Both are great gifts for wine lovers. Here are our recommendations for some wonderful wine decanters. In this table, we include a description of each wine decanter as well a link to purchase some of these unique gifts for wine lovers. 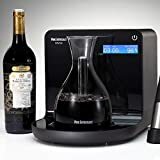 Or, take wine decanting high tech with this Wine Enthusiast Smart Electric Wine Decanter. An electric wine decanter can decant a bottle of wine in minutes or even seconds. It uses a revolutionary “oxygen extraction technology” that removes moisture, dust, and odors. This aerates the wine, not only quickly, but also without added chemicals. And, it’s pretty slick, uh? Check the current price on these great gifts for wine lovers. But, one of the best wine connoisseur gifts out there has to be the Coravin Wine Preservation System. When I first saw this, I thought it was amazing. Sure, we rarely open a bottle of wine at home without finishing it. But, for true wine connoisseurs, ones who have amazing collections in their wine cellar, there may be a situation where you only want a single glass of wine. In this case, the Coravin System will keep fine wine safe from oxidation. We’ve seen this used at a lot of wineries, so they can offer wine tastings without ruining a new bottle of wine. 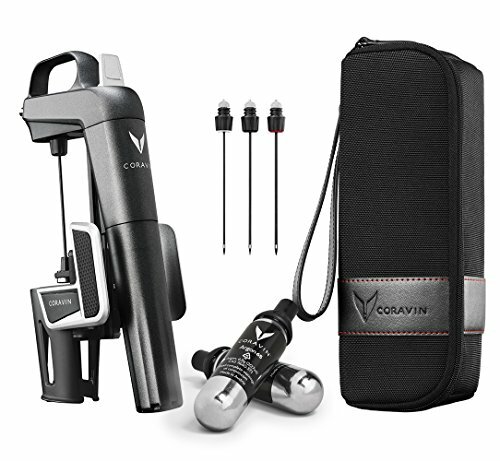 This set comes with the Coravin, four gas capsules, and a handy carrying case. And, it comes in fun colors, like red and pink too! Check the current price for these cool gifts for wine lovers. Another great wine accessory gift includes a box of unbreakable wine glasses. That’s a huge problem for us. Sure, we have fancier red and white wine glasses, and even a set of cava glasses at our home in Girona. But, we’ve had such a problem with breaking glasses that we tend to use stemless glasses for our everyday drinking. These unbreakable wine glasses solve that problem. There are a few different kinds. 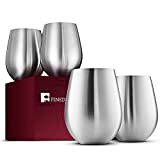 There are stainless steel wine glass options, like these VonShef Wine Glasses or similar ones that are stemless, like these stemless stainless steel wine glasses. But, most of the unbreakable wine glasses are made of Tritan plastic. Some of them are clear and look just like traditional wine glasses, others are opaque, or come in cool colors. There are so many different options, but after doing the research, these are some of our top recommended unbreakable wine glasses. And, as much as each of these wine glass options could make a great wine gift, if you prefer something with a little more flair, these Yo Bistro wine glasses come in a cute cylindrical box. Perfect for gift giving. Who doesn’t enjoy a Champagne delivery at the door? That’s why a Champagne gift set is the perfect gift for sparkling wine drinkers on your list. It just screams celebration. Obviously, it’s one of the most perfect Christmas gifts for wine lovers, because they can drink the gift on New Year’s Eve. But, it’s possible to send a Champagne gift set all year round: to celebrate weddings, anniversaries, birthdays, and more. A bottle of bubbly also makes for great corporate wine gifts too. It’s possible to order a Champagne gift delivery from companies like Wired for Wine. Wired for Wine only offers Champagnes, and other wines, that have been vetted and placed into their 90+ wine club. Or, you can even order an Aperol Spritz combo, with sparkling wine and a bottle of Aperol. 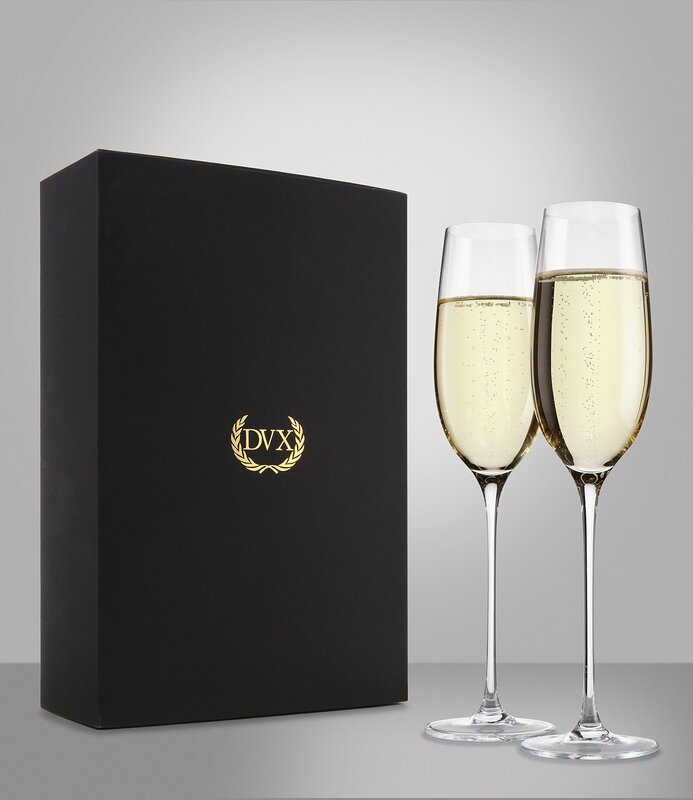 Or, this Champagne Glasses Gift Set is the perfect Champagne gift delivery without the actual shipment of wine. These glasses are actually lead-free, titanium crystal, and they come in a lovely gift box. They are made in Bohemia, in the Czech Republic, which has a relatively unknown Czech wine region, both in Bohemia and Moravia. Even more unique, these Champagne glasses are also tapered in a way that prevents the bubbles from tickling the nose. They are perfect as birthday or Christmas gifts for wine lovers. Check the current price for these great wine gifts. Another great gift to Champagne lovers, or even white wine lovers, is this Kato Insulated Wine Tote Bag. It comes in several colors. In particular, the grey could even make a great wine gift for a guy too, it’s not too feminine. It holds two bottles of wine in its insulated pouch, and there is an outside pocket for accessories. Check out the current price for these gift ideas for wine drinkers. Or, get something even more creative for the sparkling wine lover. A Bubbly Starter Set is the perfect wine gift. 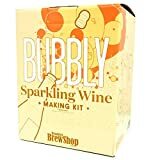 This sparkling wine making kit has everything needed to make sparkling wine at home, including a glass fermenter and brew equipment. I can’t guarantee the quality of the sparkling wine produced, but it has to be fun to experiment! Check out the current price for these fun wine gifts for sparkling wine lovers. But the gift ideas for Champagne lovers don’t end there. There is a Champagne Cocktail Carryon Kit. This kit has everything a Champagne lover needs to make a Champagne cocktail on their next flight. There are wine stoppers for Champagne and sparkling wine, to help keep the fizz. And, there are If You Can Read This Bring Me Champagne Socks too! One of the best things about red wine gift ideas is that a lot of them focus on how to best drink red wine. These red wine gifts tend to focus on temperature, storage, and most important, drinking red wine in the most optimal way. But, first, there are also some amazing books that make a great gift for red wine lovers. This book, I Taste Red, by Jamie Goode focuses on the science of drinking wine, which is something many wine lovers don’t truly understand. It’s possible to purchase a red wine online club membership through a company like PLONK Wine Club. PLONK Wine Club offers the ability to purchase a wine club subscription that focuses on international red varietals. Or, shopping for a home cook? 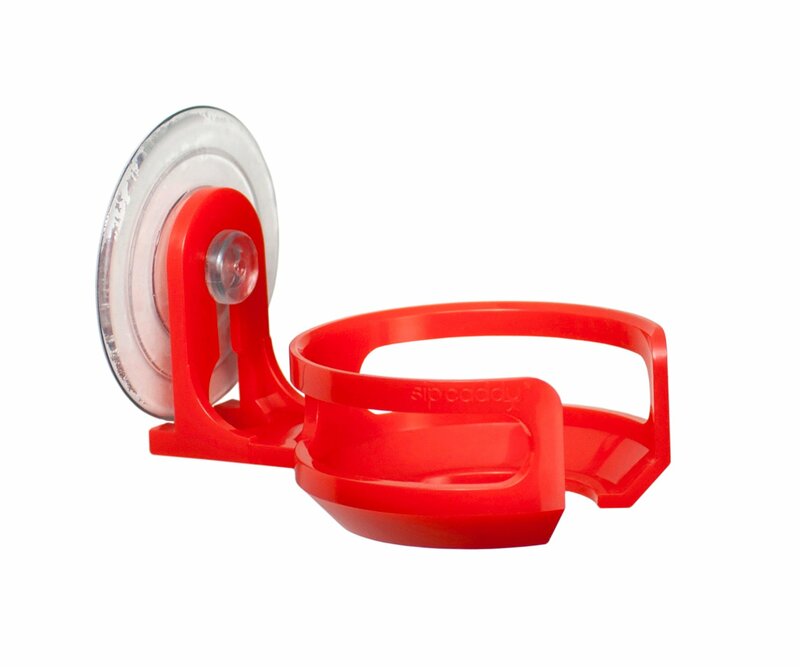 Check out these great gifts for cooks. But, there are some online wine gifts that are great for red wine drinkers, even without the delivery of a wine bottle. 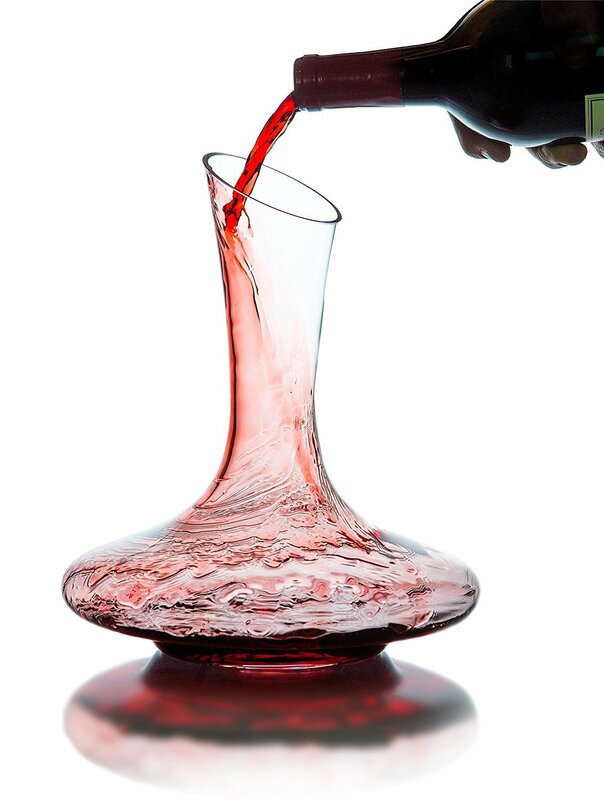 These Hand Blown Stemless Red Wine Glasses actually spin to naturally aerate the wine. The folks over at Veracity & Verve are also dedicated to helping wine drinkers bring out the true flavors of the red wines they drink. They even say this “wine glass gift set is a great way to show someone you love them.” Their words, not mine. And, they offer a red wine decanter as well to pair with the glasses. 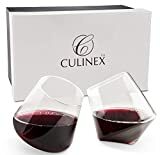 Hand Blown Stemless Wine Glasses, Set of 2 - Naturally Aerating, Elegant Wine Glassware for Cabernet, Pinot Noir, Merlot, and Blends - CulinexCo.com Spinning Wine Tumblers for Him and Her, 12 Oz. Taking wine aeration one step further is this wickedly cool Stemless Aerating Wine Glasses. Chevalier’s stemless aerating wine glasses don’t rely on centrifuge like Veracity & Verve. Instead, the wine is poured into the glass and aerated through little holes. And, it works not only for red wine and white wine but even for scotch. For scotch, you can pour the liquor over the ice to chill the liquor, without diluting it with melting ice. Looking for the absolute BEST gift for red wine lovers? How about a dual zone wine refrigerator? Check out our reviews of the best wine fridge. Sometimes the best gifts for wine lovers are the most unique online gifts, something you can’t find in wine stores. 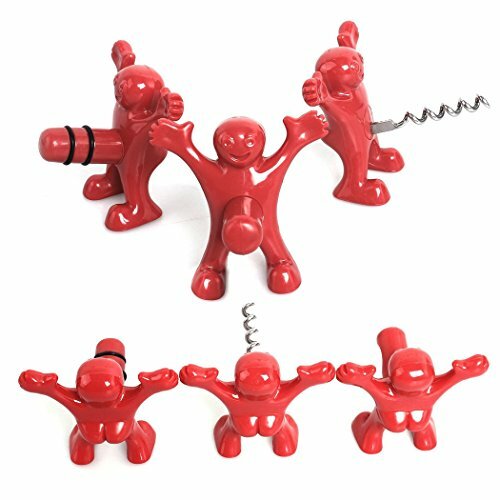 These are the gifts that are a little funkier, and like the Man-Shaped Wine Stopper and corkscrew above, can even be a little crass. (They also make a set of two wine stoppers, click here to see what they look like.). Or, for something a little more crass, how about some wine condoms. Yes, that’s a thing! But not all wine themed gifts are so uncouth (even if they are fun). 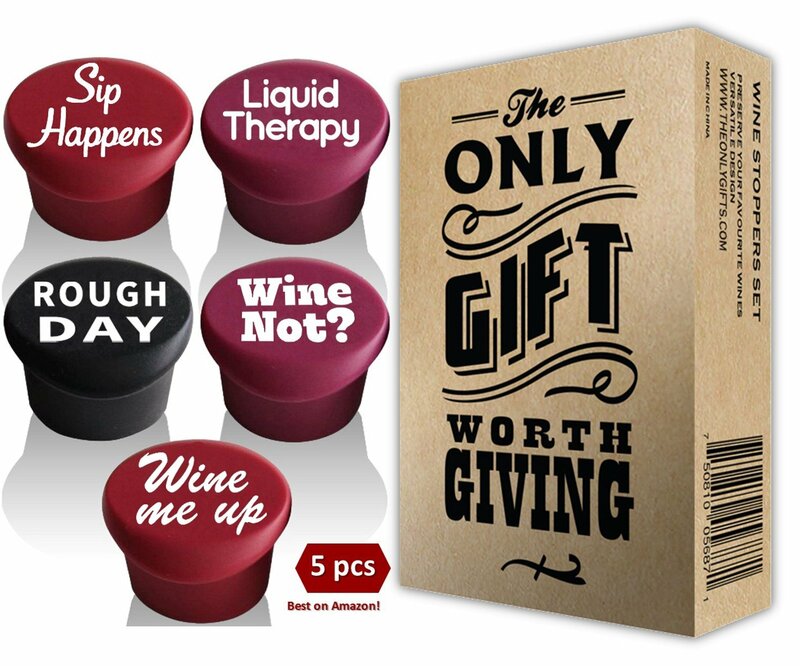 Some are cool wine gifts, like these Funny Silicone Reusable Wine Stoppers, which are dishwasher safe, and can work for both wine bottles and beer bottles. And, one of them reads “Sip Happens” and sometimes it really does! These are some funny wine accessories for wine lovers. Others are pretty creative, but also entirely practical too. What about a Wine2Go portable wine flask? It’s essentially a foldable wine bottle. Just take an entire wine bottle, fill up the “flask,” and travel without breaking a glass bottle. When done, rinse it out, dry, and repeat. And, who wouldn’t want a set of two wine glasses, that each hold about half a bottle of wine on their own? These Split A Bottle wine glasses allow two people to share a bottle of wine (equally) without having to refill a glass. So, yes, this is a little lazy, but there’s no fighting over who ends up with more wine! They make funny gifts for wine lovers. Some of these novelty wine gifts really are cute. Like this SipCaddy, which sticks to the bath tile to allow you to drink wine while in the tub! It comes in a variety of colors to match any decor. Or, there are Wine Game Kits that set wine drinkers up at home to do blind wine tastings. These wine lover gifts will put any serious wine lover in their place. It’s not as easy as it might seem! But, it also helps new wine drinkers understand how to taste wine, rather than just merely drink wine. And, it can be one of the most unusual wine gifts because it is not often something that people purchase for themselves. But, one of the best wine gifts for the most discerning, and adventurous wine lover has to be a Home Wine Making Starter Kit. 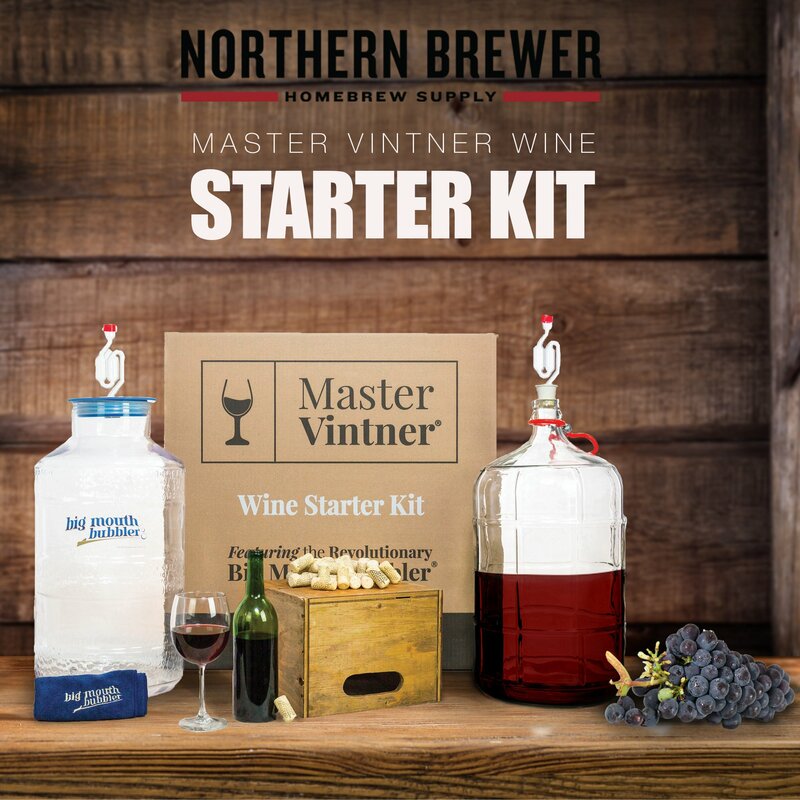 This home winemaking kit includes all of the tools needed to produce wine from any wine ingredient recipe (which is not included), along with a DVD to help novice winemakers understand all of the steps. Even without the recipes, which are easy to find online, this is one fine wine gift. When it comes to finding a great wine gift for the woman in your life, sure it’s possible to put together some wine and chocolate gift baskets from your local wine shop. 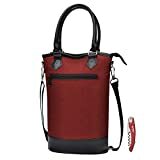 But, how about something a little more unique, and a little more practical, like a wine purse? Yes, there is such a thing and they make great wine gifts for her. The PortoVino Wine Purse holds up to 1.5 liters of wine, inside a cooled wine bag. Then you can dispense the wine directly from the purse, like a classier wine in a box. With better quality wine. It’s a great way to drink wine on the go, without the mess. There’s also plenty of room for wallet, cell phone, keys, and more. 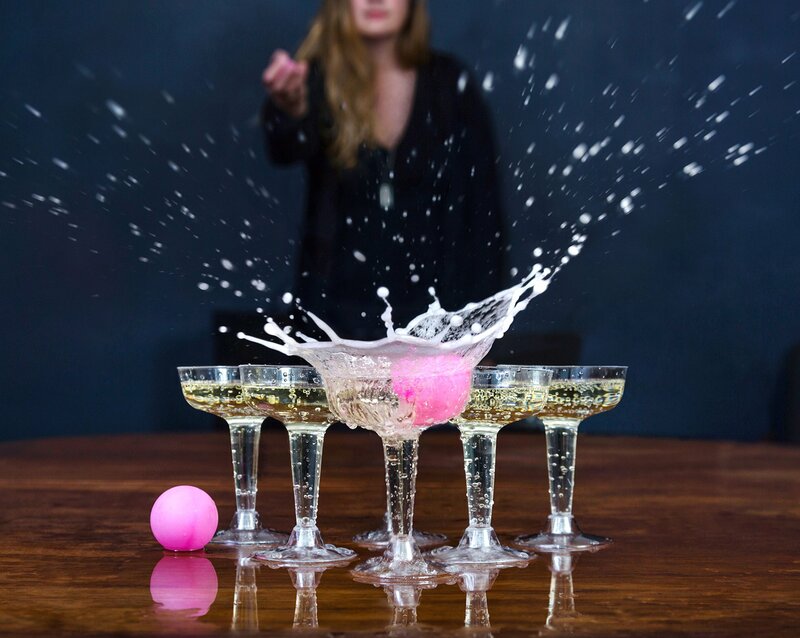 Alternatively, maybe something that is also unique, but perhaps a little less practical, like this Champagne Party Pong Set. Yes, beer bong goes upmarket, with a set of plastic Champange flutes, and hot pink ping pong balls. Not necessarily for the practical wine drinker, but definitely for the the wine drinker that likes to have fun! Or, get on the rose gold trend with this Rose Gold Wine Opener. 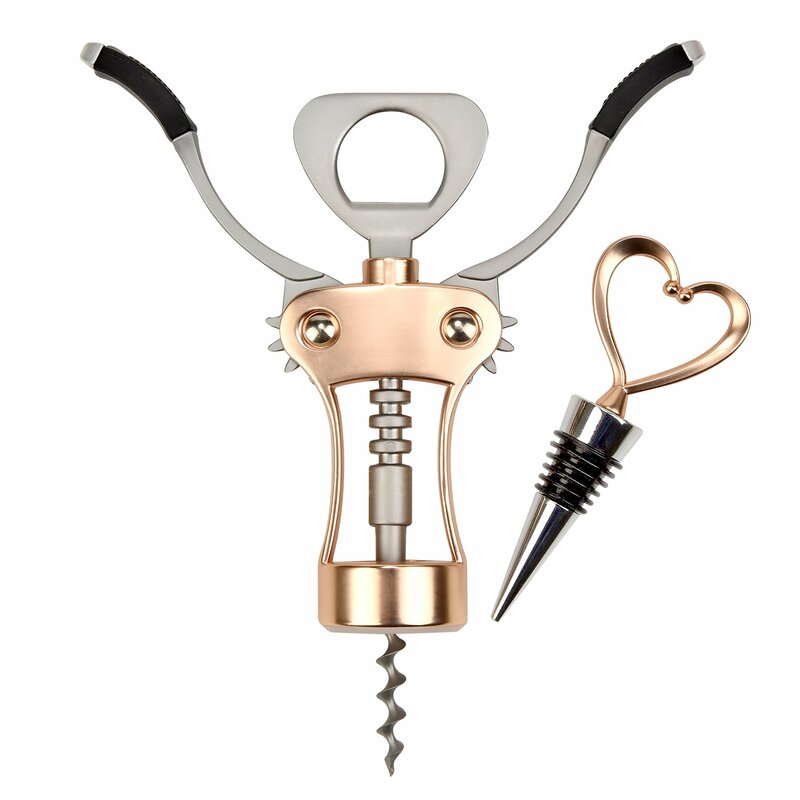 The wine opener also comes with a heart shaped wine bottle stopper. They are both elegant, and feminine, without screaming hot pink! And for the mom wine and coffee lover, how about a Funny Wine Glass and Coffee Mug gift set. 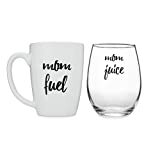 These statements could be expressed all day, which means the gift can be used all day – whether mom needs “Mom Fuel” or “Mom Juice”! Other ideas for wine gifts for her include a bangle bracelet that doubles as a flask. Or, a stemless wine glass with a phrase every woman can understand. Or, a wine coloring book for relaxation. Is it possible to have wine gifts delivered next day? It depends on the company. But, yes, because many of our recommended wine gifts can be purchased from Amazon, and most of the gifts above are available through Amazon Prime. With Amazon Prime, some items can be delivered next day depending on your city. Look for this option when purchasing one of these wine gifts. Is it okay to send wine to a friend? Whether it’s wine, or just one of our recommended good gifts for wine lovers, yes, it is okay to send a gift of wine to a friend, so long as you are 100% sure your friend drinks wine. Is it okay to buy a wine refrigerator as a gift? Heck yeah! Check out our review of the best small wine refrigerators. And, unless you know the person has sufficient room, stick to one on the smaller side.